This CD release was produced from the original 16-track analog master tapes running at 15 inches per second. Due to the length limitations of the CD format, some very minor adjustments had to be made to the show's running order, both to keep all of the musical sequences intact and to present you with the complete show, unabridged. A note on the bonus tracks at the end of CD #2, from May 24, 1972, at The Lyceum in London: this is the last-ever version of "Turn On Your Lovelight" sung by Pigpen, included for your enjoyment. Rockin' the Rhein was released in May 2004. It is a live recording of 4/24/72 from the Rheinhalle in Duesseldoft, Germany with some filler from 5/24/72 at The Strand Lyceum, London, England. The very next show after 4/24/72 was 4/26/72 at Jahrhundert Hall in Frankfurt, Germany, which previously was released as the album Hundred Year Hall in 1995. The filler on the second CD was Lovelight --> The Stranger with the rest of the album coming from 4/24/72. This particular Lovelight was the last sung by Pigpen before his death. 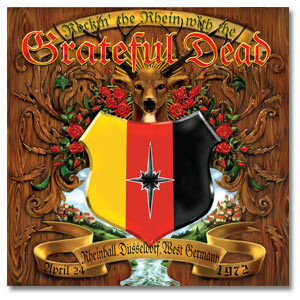 Two other releases which came from this particularly awesome European tour were the classic Europe '72 and Steppin' Out with the Grateful Dead.